Course On Devotional Music is an event that took place between 01-May-2006 and 13-May-2006 in Hyderabad. Your child needn't only headbang to rock and rap. A refreshing change would be classical music, soothing to the ears and vastly knowledgeable in its import. A visit to our cultural roots is always a good thing. Vivekananda Institute Of Human Excellence is conducting a course on devotional music for children. It is for children in the age group of 8 to 15 years. 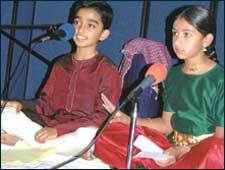 The course introduces Carnatic (vocal) music to the children. The fee is Rs. 100 per child. Be the first to comment on Course On Devotional Music! Just use the simple form below. fullhyd.com has 700,000+ monthly visits. Tell Hyderabad what you feel about Course On Devotional Music!